The assassination on Thursday of the leftist leader of the Popular Front, Mohamed Brahmi, provoked no end of trouble in Tunisia on Friday. The left and the middle and upper class secularists tended to blame it on the ruling Renaissance (Ennahda) Party, a party of the religious Right. Some outright accused Renaissance of being behind the killing, while others felt that the party had not been vigorous enough in curbing the al-Qaeda affiliate, Ansar al-Sharia, led by former Afghanistan jihadi Abu Iyadh. The General Union of Tunisian Workers (UGTT) called for a two-day general strike, which began Friday and appears to have been widely observed, given the shuttered storefronts visible in video from Tunis and other cities. Activists also staged marches in Tunis and in several other cities. They called for the fall of the Renaissance Party government and the dissolution of the elected transitional parliament. In Gafsa, a phosphate mining town and hotbed of union activism, a young man was struck in the head with a tear gas cylinder launched by police, and was killed. Over 40 members of parliament announced that they were suspending any activity in the Tunisian Constituent Assembly, the transitional parliament and constitution-drafting body. They had been tempted to simply resign from the 217-member body, but then they would have been replaced, so they froze their activity instead. Some of them were planning to join a sit-in outside the parliament building. The collapse of the elected legislature would prove fatal to the transition process as it had proceeded to this point. 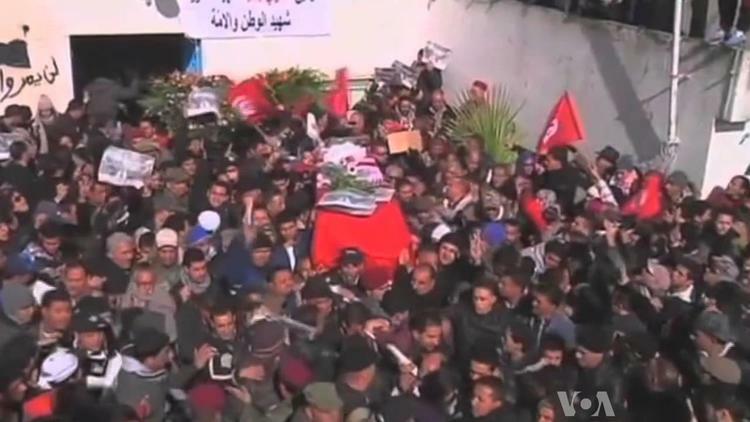 The slain parliamentarian, Brahmi, hailed from Sidi Bouzid, the provincial town where Mohamed Bouazizi set himself afire in late fall of 2010, setting off the Tunisian and other Arab political upheavals. Angry crowds in Sidi Bouzid province on Thursday night into Friday morning set fire to the Renaissance Party HQ. On Friday, there were further demonstrations, and city leaders declared that they had formed a self-governing council and had seceded from Tunisia until such time as the Muslim fundamentalist Renaissance Party government had fallen. The situation in Tunisia is critical, as the political left, joined by well-off secularists, squares off against the religious Right. The primary issue at this point is Prime Minister Ali Larayedh’s apparent inability to provide basic security in the country. But disputes over labor policy and neoliberalism are also behind the split. Leftists maintain that the constituent assembly was elected to serve for only one year, until Oct. 23, 2012, by which time it should have drafted a new constitution and begun moving to the election of a regular parliament. They feel that the Renaissance Party has dragged its feet on the constitution in order to remain in power long after its mandate had expired. The government maintains that the constitution is just about finished and that elections will be held some time this fall. If the government did fall over the assassination, it is difficult to imagine at this point what would take its place (unlike in Egypt, the military is small and relatively weak).